Yep! He looks like a fellow collector! I like the word “teammate.” Someone who gives selflessly. 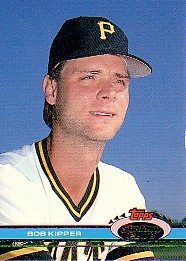 I never played with the major league pitcher. But I like to think I’m on the same team as Jeff Schultz. The http://www.sportscollectors.net/ member posted that he received 4 out of 4 cards returned autographed by the South Carolina retiree in November, all in less than 10 days. Jeff added the mention that he enclosed 46 extras for the one-time Pirate. Jeff knew that Mr. Kipper was a collector. He knew about the 1997 house fire that wiped out the former player’s collection. A sincere thank-you note came after the gift. He didn’t sell Bob Kipper the cards. He didn’t trade him extra cards. You don’t have to enclose money or extra cards when you write to former players. You know what you hope to get from the letter. Before you mail, ask yourself what you’re GIVING the person you’ve written. Coming Thursday: Remembering Phillies broadcaster Andy Musser!